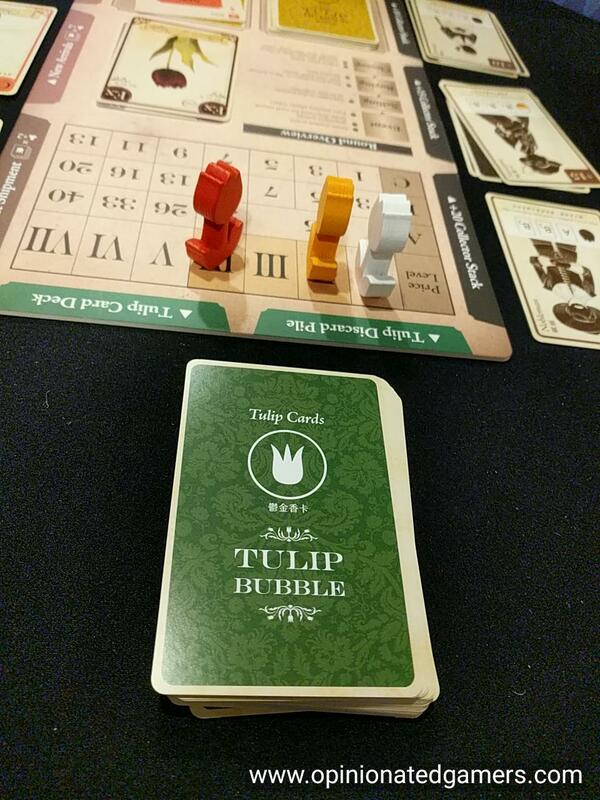 Tulip Bubble is the second game that I have played that tries to recreate the craziness surrounding the Tulipmania economic bubble of 1636-1637. In this short time, people made (and lost) fortunes trading and speculating on the tulip market. There is a market board which shows the prices of the different tulip varieties – in a chart found near the top of the board. 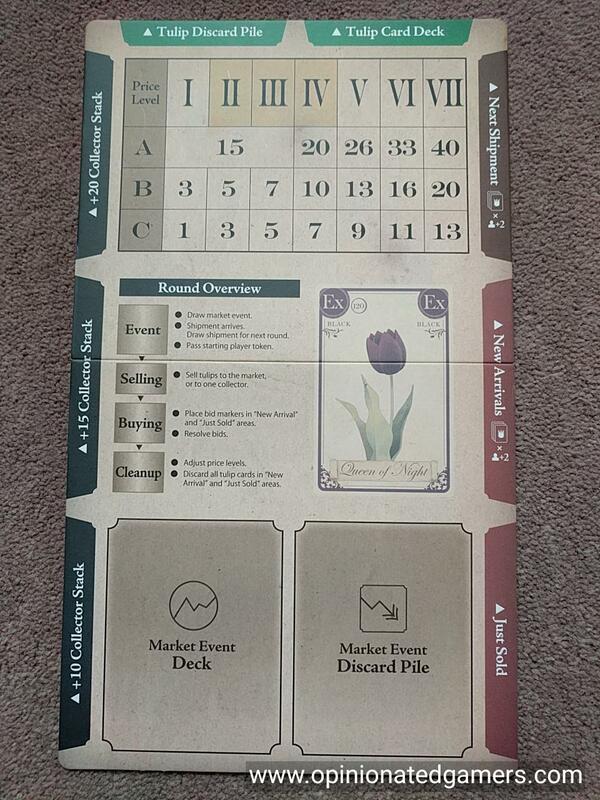 A tulip market will be shown to the right of the board. Three rows of cards are prepared with two more cards than the number of players in each row. There are three different colors of tulips, that are divided into A, B and C class tulips. 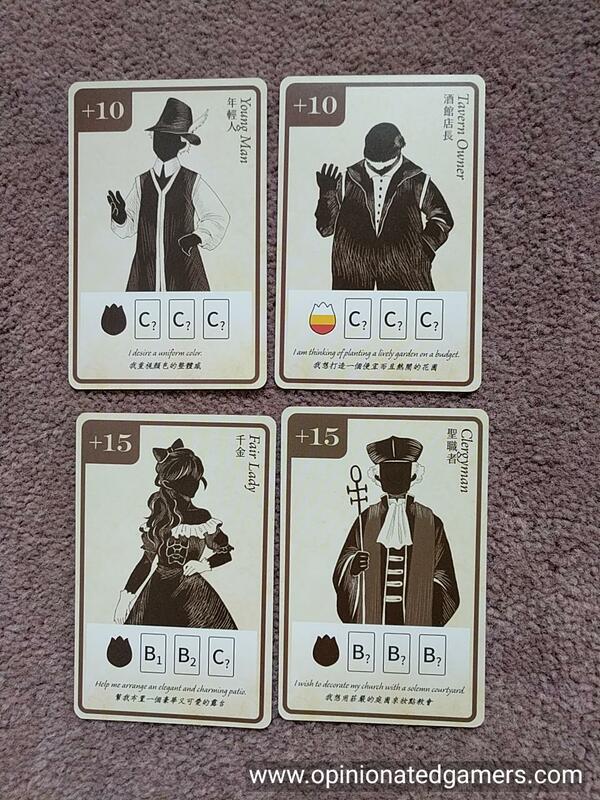 At the start of the game, the three price markers (for the three different colors) are randomized and placed on the 2, 3 and 4 spaces of the price track (which goes from 1-7). There is a Market Event deck. One card is randomly discarded from the game unseen. The “Bubble Bust” card which signifies the game end is shuffled with the bottom two Event cards so that it will be one of the last three cards drawn. The first card on the Event deck is flipped over, and the event is applied (it should be to change the price of one of the tulips). The collector cards are separated by bonus value and each deck is placed on the left of the board. 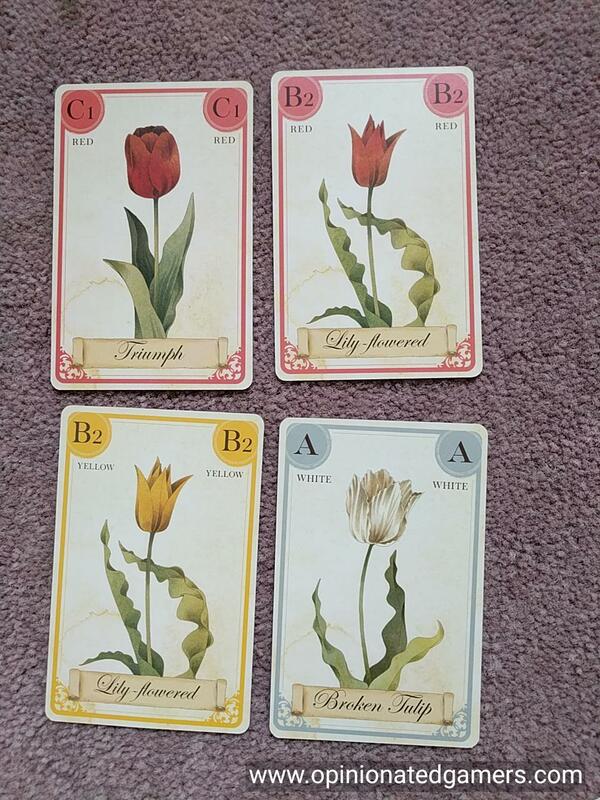 In the Event Phase, the top card from the Event Deck is revealed, and the price of the tulips are changed. Note that each space on the price track can only hold one tulip marker, so if a tulip marker is moving onto an occupied space, it keeps moving in the same direction to land on an empty space. Most of the cards affect a specific color, but some will cause the cheapest color to rise or the most expensive to fall. If you see the “Bubble Bust” card, the game ends immediately. All tulips in the “Next Shipment” row at the top of the display are now moved down into the “New Arrivals” area in the middle. Finally, the start player token is passed clockwise. In the Buying phase, first check to see if anyone can buy the Black Tulip card (120 gulider cost). If so, the player buys it and the game ends immediately! Each player has three bid markers (usually). From the start player, there are two rounds of bid marker placement. In the first round, players may place up to two markers on cards in either the “New Arrivals” or the “Just Sold” row. In the second round, players may only place one marker. You may place on any card in those two rows, but you may not place more than once on the same card. You then resolve all the bids going from left to right in each row. If there is only one marker on a card, the owner of that marker buys the card underneath at the market rate. If there are 2 or more markers on a card, there is an auction – with the starting bid being the current market price. Bidding goes clockwise from the start player, and each successive player must increase the bid by at least one guilder or drop out. Once someone has the highest bid, he then either buys the card with cash or finances the tulip. To buy it with cash, the amount is paid to the bank. All non-winning players divide the difference between the bid price and the market value and each takes an equal share (rounding down). If you choose to finance the tulip, you borrow money from the bank – for the entire amount of the bid. Take these coins from the bank and place it on the tulip card. Your bid marker also remains on this financed tulip card and you cannot use that marker again until you have sold this financed tulip. The non-winning players will still get their compensation as noted above. You can buy the card back at any time by paying a matching amount of money as is on the card to the bank. You can then take the card behind your screen. You could also leave the financing on the tulip card and simply sell the card later in the game – the bank will of course take its share first before you get any remaining profit. In the cleanup phase, tulips prices are then changed based on the current state of the market. Count up the number of tulips of each color which remain on the table (i.e. those in the Next Arrival row as well as those in the bottom two rows that were not purchased in the Buying Phase). The color with the most cards present moves down one space on the track. The color with the least present then moves up one space. In both cases, if there is a tie, both tied colors move up or down. Now, remove the tulip cards from the bottom two rows on the display, and place these cards into the discard pile. The game then moves into the next round. 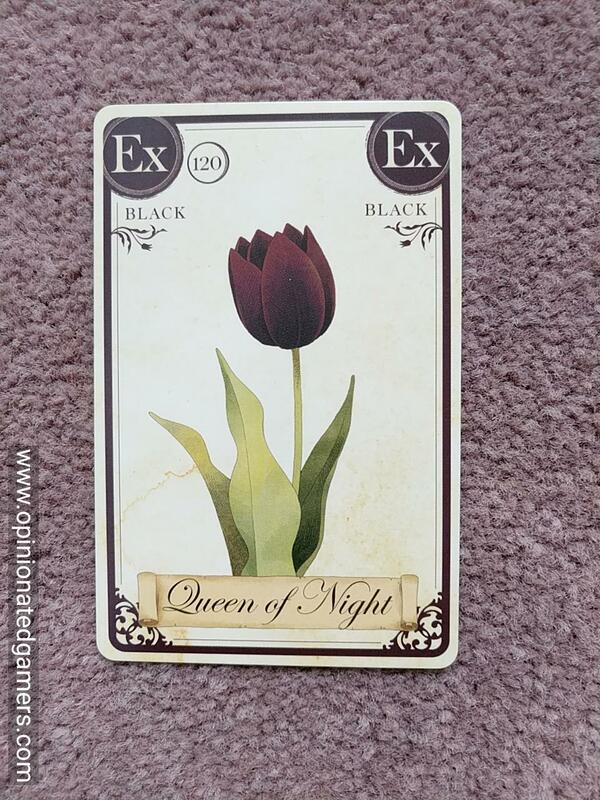 The game ends when one of two conditions is met: 1) A player buys the Black Tulip card in a buying phase – that player wins immediately – or 2) when the “Bubble Bust” event card is flipped up. If this happens, the player with the most money will win… But before the game ends, all financed tulip cards are converted into debt – players must pay the bank coins equal to those on the financed card. All tulip cards which have not yet been sold are now worth nothing. The player who has the most money left after paying debts is the winner. 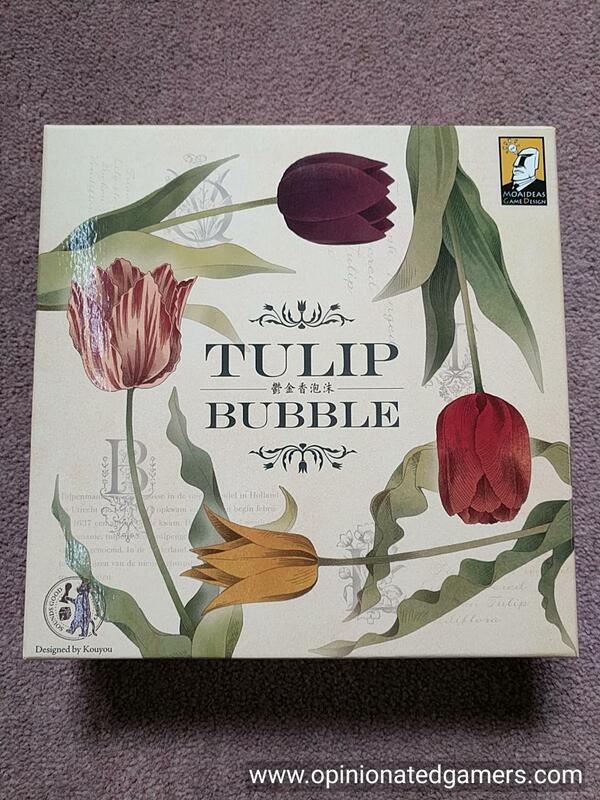 Tulip Bubble is one of those economic games that I’ve never been able to quite figure out how it works. Or maybe it’s just the whole Tulip bubble of 1637. 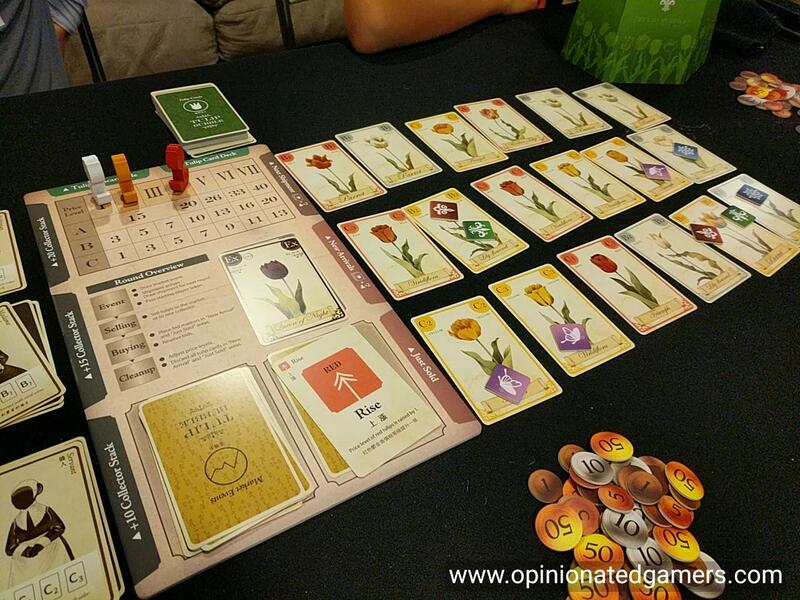 Though it’s been a few years, I remember having the same bewildering/befuddling feeling about Tulipmania 1637, a game from 2009 done by a good friend in Scott Nicholson. As a history student, it didn’t make sense to me how the economic speculation around flowers could have spiraled so out of control. The games which use this bubble as a theme involve the same sort of mystifying forces. 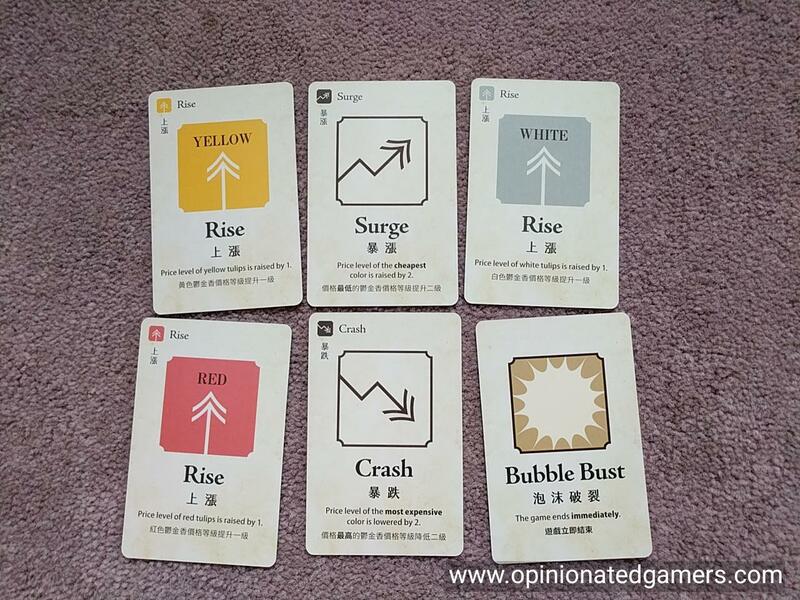 At the start of the game, the Market Forces cards can be a big randomizer as the majority of the deck is unknown. However, as you reach the end of the game, you have a much better chance of guessing what will show up based on the cards that you’ve already seen earlier. However, you can’t be too sure of yourself because the game can suddenly end anywhere in the last three rounds – so once you think you have a better idea of what is coming, the rug can be pulled out from underneath you! I love the mechanism of financing tulips. It is possible to buy cards early in the game on credit and then ride out the market until those types of cards become more valuable. However, the cost of losing a bidding marker each round per tulip you have on credit prevents you from loading up too much on this sort of strategy. There is no upper limit to the amount that you can finance (well, other than three total finanaced tulips at one time) – so, there is nearly an unlimited opportunity to hose yourself, or I suppose to make money too… The financing becomes a bigger gamble near the end of the game because all unsold tulips at the Bubble Burst are worth nothing, and all debt still alive must be paid back at the end of the game. Speaking of the end of the game – it is a most abrupt and unexpected sort of ending. Sure, you know that it will be one of the last three cards, but outside of that, it’s just luck of the draw when the card comes up. That being said, the game is often decided by the player who is best able to time their actions to end on the right round. You can play it safe and sell all your tulips early so that you’re not left holding any worthless tulips at the end of the game. However, if you do this, you might cut short your opportunities to make money. You could also decide to gamble and buy tulips near the end of the game hoping to turn them around quickly for profit, but if the bubble bursts on you, you end up losing all of the money that you spent to buy them up. Normally, I really dislike games that I don’t fully understand, this one is strangely compelling. I keep wanting to try the game again to see if I have it figured out any better. I will say, that I felt a bit more control of the market by my third game, but there were still plenty of occasions where the game or the actions of my opponents threw a monkey wrench into my own plans. For many, the wild swings of the market as well as the abrupt end of the game will be unappealing; however, I have enjoyed my plays so far, and despite all the uncertainty, I find that I still want to go back and explore the game more to try to figure it out. Ratings from the Opinionated Gamers.